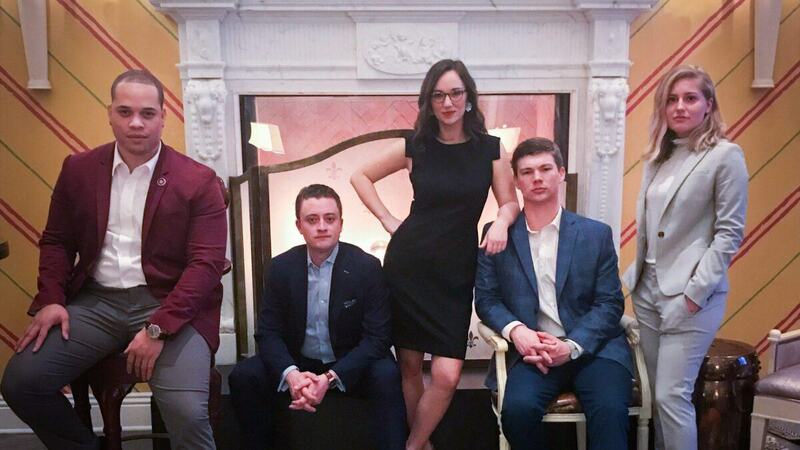 RALEIGH — A Campbell Law team of student advocates has won the national championship at the American Association of Justice (AAJ) Student Trial Advocacy Competition which took place April 11–14 in Philadelphia, Pennsylvania. After claiming the Raleigh regional championship title in early March to punch their ticket into the national competition, third-year student Anna Claire Turpin and second-year students Lydia Stoney, Kevin Littlejohn, and Ethan Carpenter defeated cohort regional champions UC-Boulder (Denver, Colorado, region); Belmont University (Louisville, Kentucky, region); University of Alabama (Birmingham, Alabama, region); Stetson University (West Palm Beach, Florida, region); and University of Akron (Cleveland, Ohio, region) to claim the 2019 national title. The championship run was the third time Campbell Law has competed at the AAJ Student Trial Advocacy Competition national tournament since 2011, but is the first time that the school has claimed a national title. The national championship victory is the third such championship that the law school has won this year, which is also a first. The AAJ Student Trial Advocacy Competition seeks to inspire excellence in trial advocacy through training and education for both law students and practicing attorneys. The Association accomplishes this goal in part by sponsoring the Student Trial Advocacy Competition, an annual nationwide mock trial competition. The competition is an exceptional opportunity for law students to develop and practice their trial advocacy skills before distinguished members of the bar and bench. Marcari, Russotto, Spencer and Balaban sponsored the winning team of student advocates. The firm’s generosity provided financial assistance for the students’ preparation, travel, and lodging as they competed for the national championship.